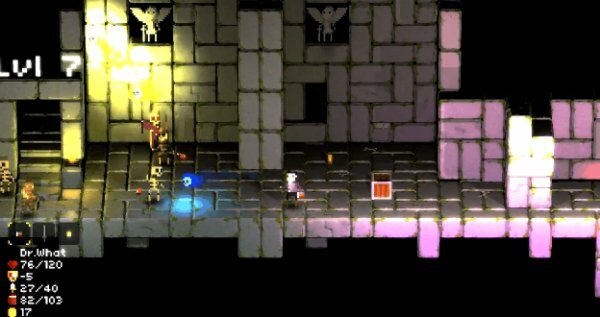 Legend of Dungeon is a side-scrolling co-op dungeon crawler for up to four players developed by robotloveskitty, a husband and wife development team. 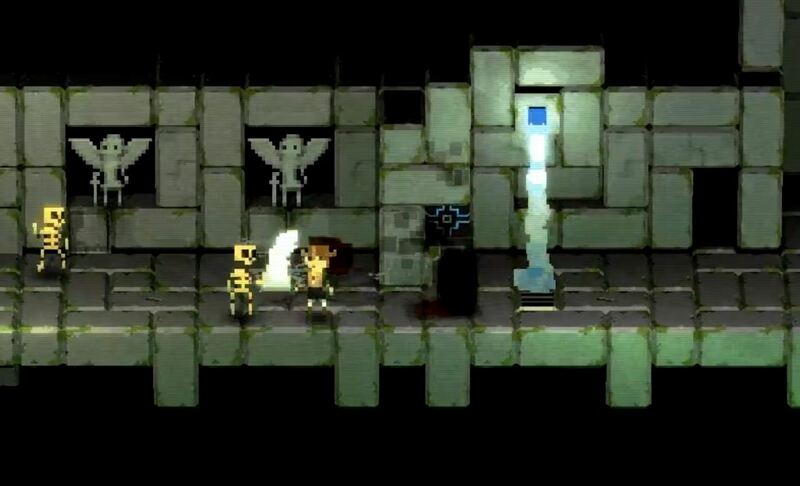 All four players share one screen as they explore the 26 randomly generated levels of the dungeon together. 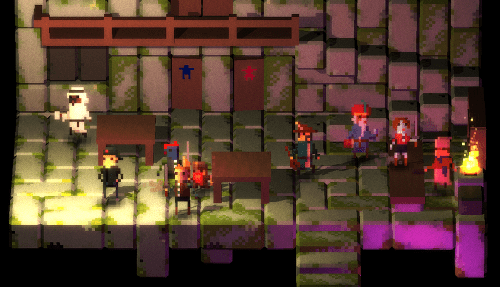 One of the first descriptions I heard of Legend of Dungeon was “beautifully lit”. I thought that was a weird way to describe a game at first, but it’s true. The lighting in this game is amazing! Since the game is four player, I had fellow oprainfallers Hailee Kenney, Josh Speer and Chantal del Puppo play the demo with me at PAX Prime. We started off in a plain stone room. We walked out of the door and took a moment to figure out which sprite was ours. They all looked really similar, but with different color palettes. It was hard to tell them apart at first, especially since we all crowd around a doorway when we enter a new room. Starting off with naught but a sword each, we set off into the dungeon. Bats, skeletons, zombies and more assaulted us as we looked for the stairs leading down to the next level. After exploring a few levels, Hailee and I had new armor to help differentiate our characters from the others. Hailee had a moose hood and I had this giant ball of electricity on my head. Unfortunately, Josh and Chantal never got their own unique equipment, or if they did they never equipped it. I would have liked to have seen more unique items, which I’m sure the game has to offer. In the group that played before us, one of the party members had a rodent of some sort perched on his head. 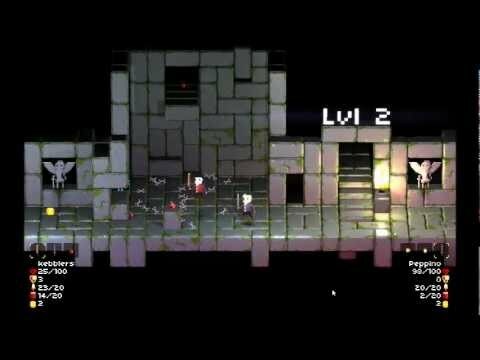 The rodent would fling its little babies at enemies to damage them while the player was fighting. It was both hilarious and confusing. We only made it to the first boss on the sixth floor. Three of us were alive, one was dead and just following as a ghost. On the sixth floor were two necromancers of some sort who summoned hordes of skeletons. I managed to kill one, but by the time I had I was the last one alive and the second necromancer finished me off. There is a lot we were unable to explore. Thanks to stretch goals from the game’s Kickstarter, Legend of Dungeon features a pet system allowing you to get a pet wolf, bear, hawk, cat or rooster, and unlockable classes including Wizard, Doctor, Ninja, Knight, Hunter, Cowboy, Necromancer and Bard. Legend of Dungeon also boasts a dynamic soundtrack which reacts when monsters are slain. The game was a lot of fun and over all, the four of us quite enjoyed it. The main complaint we all shared was the similarity of our sprites. Josh and I also wish it was more than 26 floors. Although we only made it to floor six, so surely the game gets much harder the further you delve into the dungeon. Additionally there was no way to revive fallen players, at least not that we found. Perhaps there is a way to revive lost allies further in the dungeon. Either way, adding more floors would certainly make the game more challenging and fun. Legend of Dungeon is available now for $9.99 on Windows, Mac and Linux (via Steam) as well as OUYA.